M S International Inc. (“MSI”), North America’s Leading Supplier of Premium Surfacing Products, donates to the Gary Sinise Foundation’s Restoring Independence Supporting Empowerment (R.I.S.E.) program to help a wounded veteran and his family. On October 10, 2017, US Air Force Senior Airman Brandon Byers (Ret.) 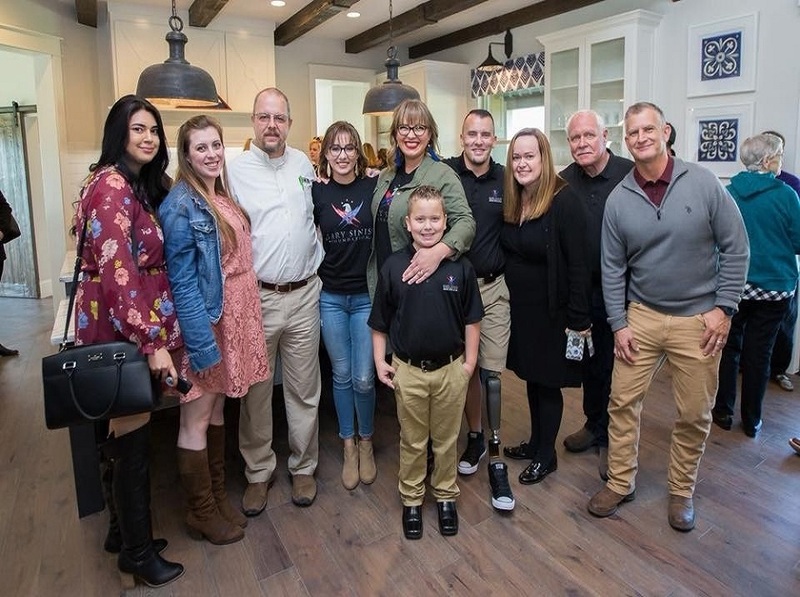 and his family were presented with an iPad for their specially adapted smart home, which was built by the Gary Sinise Foundation’s R.I.S.E. program. MSI personnel, along with many others, were on hand to help celebrate the event. MSI proudly donated surfacing materials to the specially designed McKinney, Texas home through their membership in MIA+BSI (the Natural Stone Institute). MIA+BSI supports the R.I.S.E. program by providing natural stone materials, fabrication, and installation for homes designed for severely wounded veterans and their families. Several of MSI’s most trending surfaces are featured in the home. Fantasy Brown marble countertops make an exclusive statement in the master bath, while Augusta White marble counters in the kitchen offer a luxurious, modern look. Laundry room counters are covered in chic Silvestre Gray granite and Black Pearl granite adds a touch of elegance to a kitchen office nook. The Gary Sinise Foundation honors America’s defenders, veterans, first responders, their families and those in need by creating and supporting unique programs designed to entertain, educate, inspire, strengthen and build communities. To learn more about the R.I.S.E. program and how to get involved, please visit GarySiniseFoundation.org. Founded in 1975, MSI is the leading supplier of Premium Surfaces including flooring, countertops, decorative mosaics and wall tile, and hardscaping products. MSI’s product offering includes an extensive selection of granite, marble, porcelain, ceramic, quartz, glass, quartzite, and other natural stone products. Headquartered in Orange, California, MSI also maintains distribution centers across the United States and Canada. MSI’s product line is imported from over 36 different countries on six continents bringing the very best products to the North American Market. The company maintains an inventory of over 125 million square feet of material.